As an Account Supervisor, Devika brings a background in employee engagement and government communications and a passion for cause marketing and global water issues to a number of clients in Cone Communications’ corporate responsibility discipline. Since joining Cone in 2014, Devika has supported the strategic planning and development of award-winning programs for Fortune 500 companies including UPS, Xylem, Mars, Johnson & Johnson and Visa. Most recently, she has worked closely with UPS senior leadership to develop executive bylines on a variety of topics spanning sustainable urban logistics, e-commerce and the circular economy. 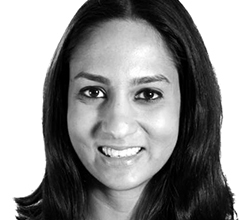 Devika has also helped elevate clients’ thought leadership and recognition by supporting the development of research whitepapers with the GreenBiz Group and the co-creation of content with the Guardian. Prior to joining Cone, Devika worked as a Communications Specialist for DigitaliBiz, a government contractor that supports the Volpe National Transportations System Center in Cambridge, Massachusetts. During her time there, Devika worked with various federal agencies to develop effective communication strategies to support government outreach efforts. Devika earned a B.S. in public relations and a B.A. in psychology from Boston University. Outside of the office, she enjoys spending time with her friends and family and trying out new restaurants in her neighborhood.